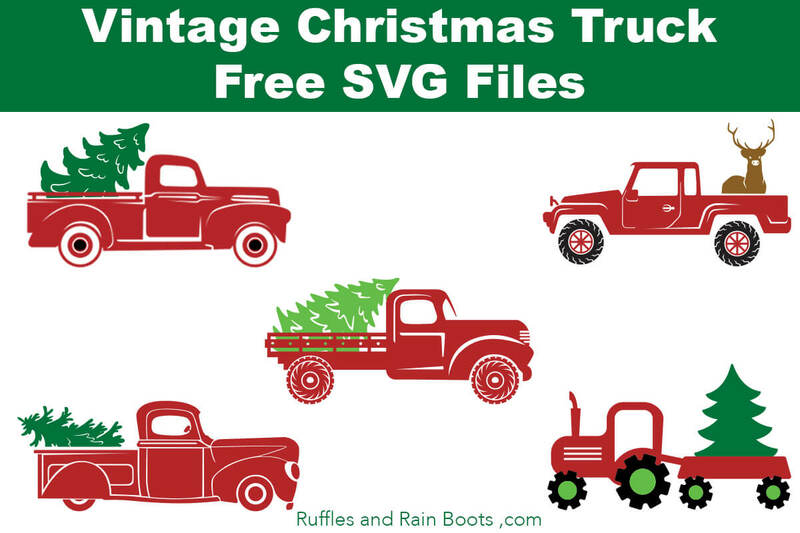 Grab one of these free Christmas truck SVG files and let the holiday crafting begin. From build-your-own to done-for-you, click to get started. If you’re new to us here on Ruffles and Rain Boots, I’m about to blow your mind! I put together free SVG files by collection and they are popular because I’m not just grabbing any old free SVG cut file, friends. Nope. I spend a great deal of time curating, testing, crafting with, and updating these collections. Be sure to subscribe to our weekly newsletter so that you can stay informed when I release a new collection. A little lower down, I’ll give you a few other popular collections. Each SVG file is linked (blue, underlined). Click on that and follow the download instructions for each site. I cannot put these files on my site but link you to the place to get them. 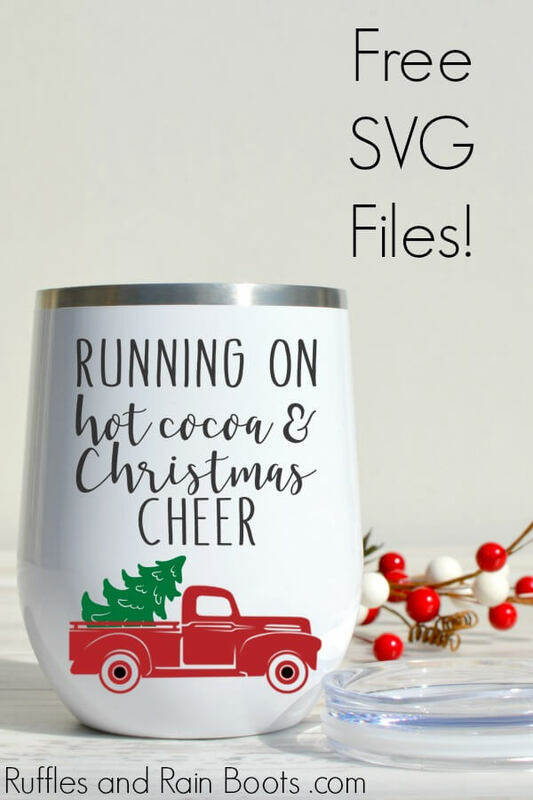 Let’s get started with these fun and free Christmas truck SVG files! I’ve sorted them by the type to make it a bit easier for you to find the perfect Christmas truck for your project. NOTE: Additional free Christmas SVGs can be found in some of the projects shared here. Access the Library (newsletter subscribers only) and get them, as well. 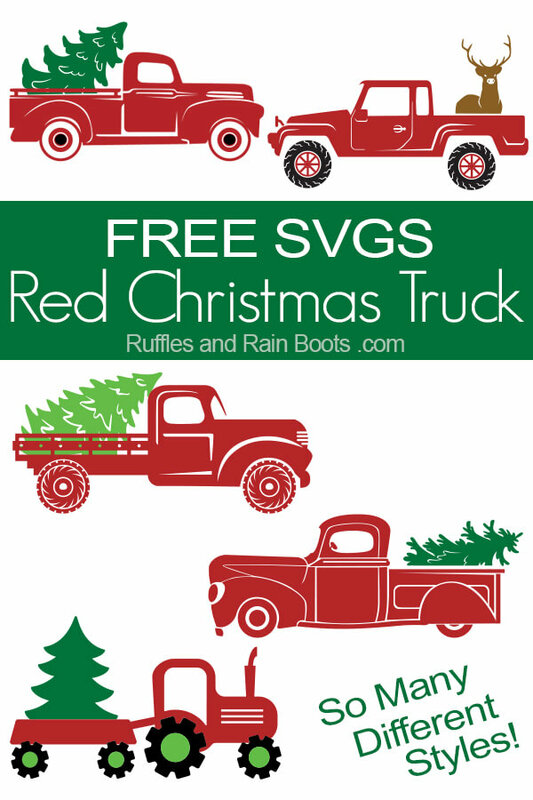 I play favorites, and friends – this is my favorite red Christmas truck SVG set. It’s free and it’s fabulous! P.S. Commercial use is included! In case you need more (and who doesn’t, really), this is my second favorite vintage truck SVG set because it has a LOT of variations. Again, commercial use is standard with this set. Never, never to be outdone, one of my favorite designers created this well-made old Christmas truck cut file. Commercial use is available for $2 here. Kind of cartoonish and perfect for a young boy’s t-shirt or gift bag, this red truck cut file sports a cute Christmas tree. This very cartoonish vintage Christmas truck would be adorable for a young child. Maybe on their very own hot cocoa mug (we use this covered tumbler for kids). This one’s not a truck, but it’s super cute. 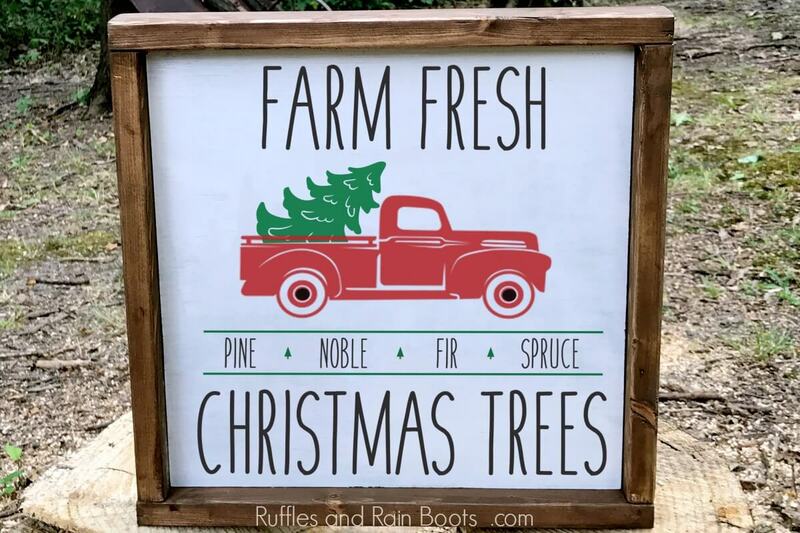 If you have a farm-lover, this tractor and Christmas tree design is just the thing. 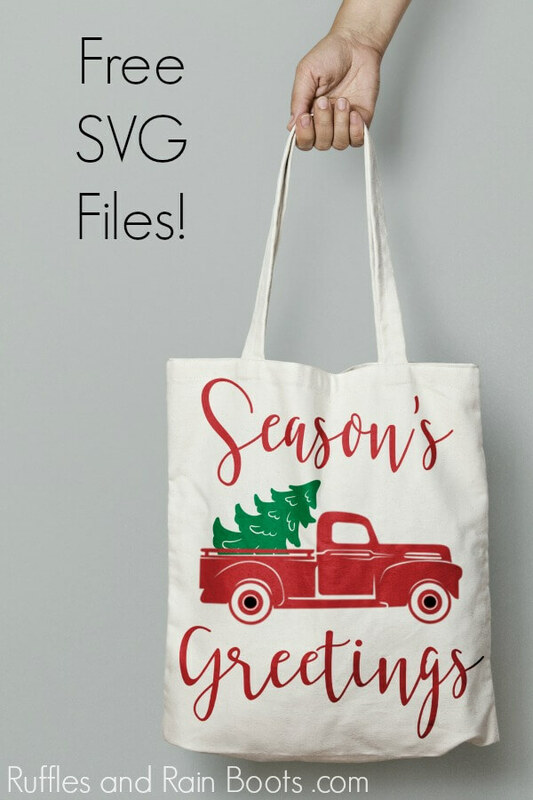 Because I believe the PERFECT SVG file for your project is out there, below are a few more of my favorite low-priced Christmas truck SVG files. You can see them in the image above (yeah, that’s plaid is my fave…). This is nearing the top for my favorite vintage red Christmas truck done-for-you project. There are 4 different scenes – not SVGs – entire scenes! Do you know a Volkswagen fan? This vintage beetle with a tree and sentiment would make a great flour sack dish towel. Y’all. 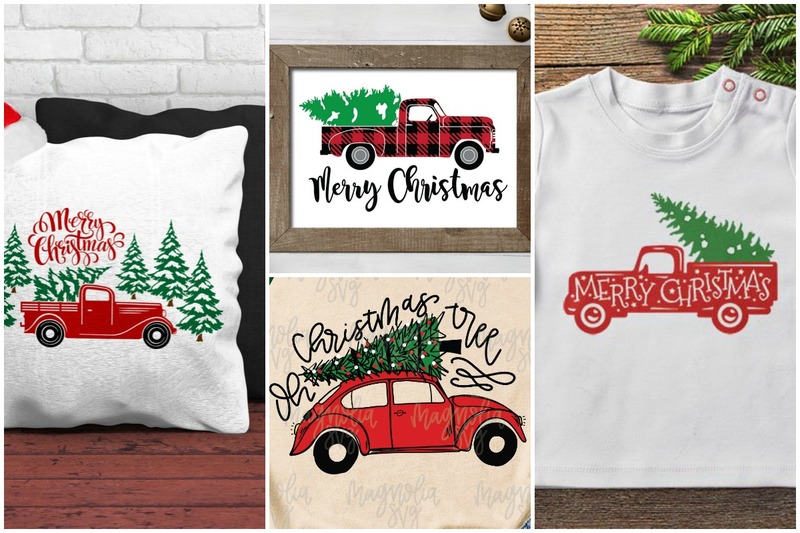 Buffalo check is my happy place and this adorable plaid Christmas truck SVG is everything! Look for a project coming soon with it. Talk about done for you. This little red truck cut file has it all – truck, tree, and an adorably wobbly Merry Christmas. Friends, I’ve just started assembling things like these and I am hooked! I made this one and it’s cute – I have it set up as a table display on a wood round and a rustic mini tree. It was my first 3D Christmas truck SVG and I used a little black ink to make it vintage. If you want to make a 3D vintage red Christmas truck with tree greeting card, here is one that is done for you. Now that’s handy. As promised, below are a few of our very popular free SVG file collections. Just click on any of them and you’ll get the best the web has to offer in free cut files! Be sure to save this to your favorite SVG file board on Pinterest. Your shares are how we grow and we are sincerely grateful. These are so cute, thank you so much. Can these be made into pes files? Oh, Janet, I’m sorry but I have zero experience converting these to embroidery files. I know there are some videos on YouTube, but I have no insight.